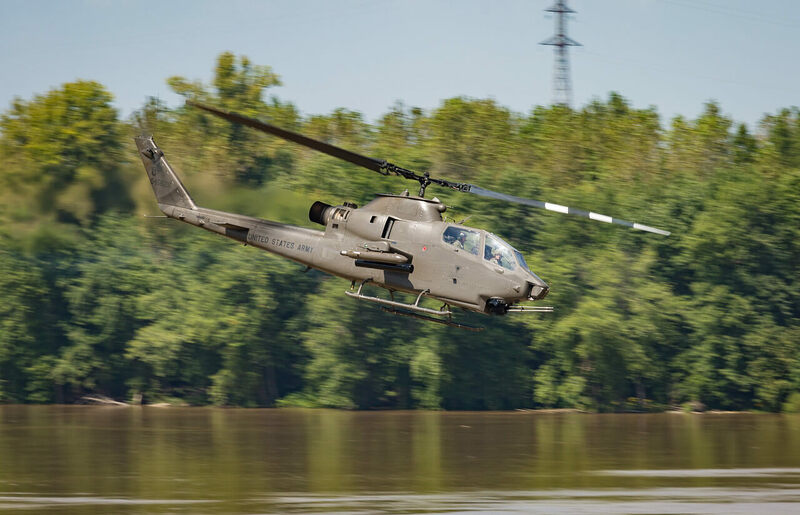 Manufactured by Bell Helicopter as an AH-1G. 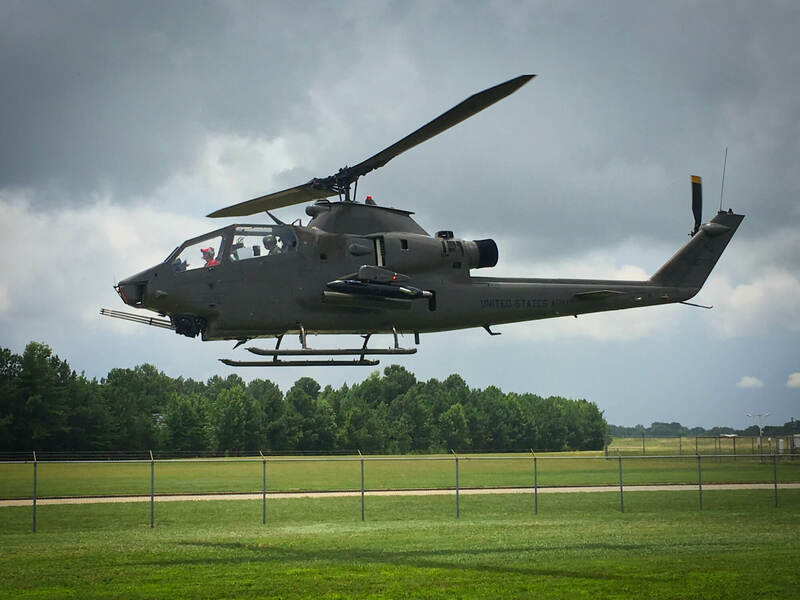 1972-1981 Accepted by U.S. Army and assigned to B Troop, 2nd Squadron, 7th Cavalry, 101st Airborne Division, Ft Campbell, KY.
1981 Returned to Bell Helicopter and converted to an AH-1S. 1982-1988 Assigned to the Air Troop, 11th Armored Cavalry Regiment (ACR) in Fulda, Germany. Patrolled the East/West German Border during the "Cold War." 1988-1992 Assigned to B Company, 8th Squadron, 158th Aviation Regiment at Fliegerhorst Kaserne in Hanau, Germany, subsequently becoming 4th Squadron, 11th ACR and participated in Operation Desert Shield / Desert Storm, 1990-1991. 1993-1996 Assigned to 4th Squadron, 3rd ACR, Ft Bliss, TX and later Ft Carson, CO.
1996-1999 Assigned to DOL/AVIM LSI, Ft Drum, NY. 1999-2001 Assigned to the Ohio Army National Guard. 2001-2005 Assigned to DOL/AVIM, Ft Drum, NY. 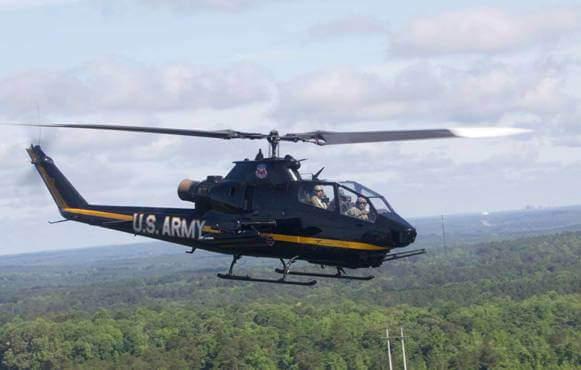 2005 Assigned to Army Aviation Heritage Foundation. 2006 Certified by the FAA at 3281.5 A/C hours as the FIRST flyable AAHF AH-1F Cobra. Assigned FAA Tail Number N998HF. 2007-2014 Participated as one of six AAHF Black and Gold Cobras supporting the U.S. Army Sky Soldiers Cobra Demonstration Team. 2014-Present Painted in Desert Storm Sand by Bell Helicopter, Ozark, AL. Dedicated to the memory of CW2 Richard D. Stroh, Quicksilver-27, 4th Squadron, 3rd ACR. 1968-1972 Accepted new from Bell Helicopter and sent directly to Vietnam. Served with A Troop, 3rd Squadron, 17th Cavalry and A Troop, 1st Squadron, 9th Cavalry. Crashed, recovered, and sent back to Bell Helicopter in Corpus Christi, TX, for rebuild. 1972-1975 Served with 175th Aviation Company in Illesheim, Germany. 1975 Loaned to NASA for research and spent two months at the Langley, VA Research Center. 1975-1981 Served with B Troop, 3rd Squadron, 5th Cavalry in Ft Lewis, WA. Modified from a G model to a F model. 1981-1989 Served with C Troop, 4th Squadron, 7th Cavalry and D Company, 1st Battalion, 2nd Aviation Regiment in Korea. 1990-1997 Served with A Company, 3rd Squadron, 501st Aviation Regiment in Germany. 1997-2001 Assigned to the Tennessee Army National Guard. 2006-Present Transferred to AAHF and restored to flying condition. Now performs with the Cobra Demo Team as part of our airshow and ride program. November 1968-1971 Assigned to A Battery, 4th Battalion, 77th Aerial Rocket Artillery (ARA), 101st Airborne Division, Camp Evans, South Vietnam. Missions included support for Ground Troops, Landing Zone Preparations, Interdictions, Counter-battery Fire and Aerial Escorts for MEDEVAC. Crashed six months after arrival in country from ground fire which took out the tail rotor, killing one pilot and wounding the other. 826 was recovered, repaired and placed back in action. 1971-1980 Crashed a second time in Vietnam. 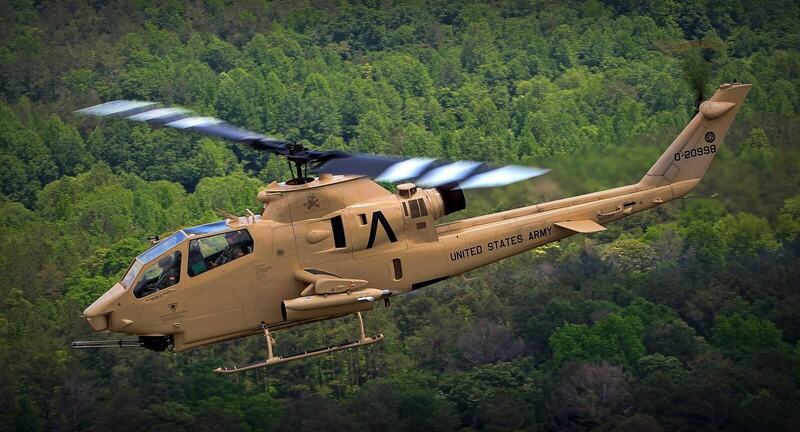 Rebuilt and saw service at Ft Hood, TX and Ft Knox, KY.
1980-1990 Modified into an AH-1F and assigned to B Company, 229th Attack Helicopter Battalion, Fort Campbell, KY.
1991-1997 Served in Operation Desert Storm with the 101st Airborne Division making it a two-time combat veteran with the same organization. Upon return from Operation Desert Storm, 826 continued to serve at Fort Campbell, KY until April 1997. 1997-2001 Served with the 1st Squadron, 230th Cavalry Regiment, Tennessee Army National Guard Smyrna, TN until September 2001. 2001-2005 Was retired into storage. 2005-PresentAcquired by the Army Aviation Heritage Foundation, restored, and FAA certified. Acquired by the Army Aviation Heritage Foundation, restored, and FAA certified. Performed for several years as part of the Army’s Cobra Demonstration Team. 1968-1971 Sent new from the factory to Vietnam and served with 227th Assault Helicopter Battalion. Flew a total of 2,727 combat hours. 1971-1981 Served with various units at Hunter Army Airfield, GA.
1981-1996 Served with various units in South Korea. 1996-2001 Assigned to the 278th Armored Cavalry Regiment (ACR), Tennessee Army National Guard, Smyrna, TN. 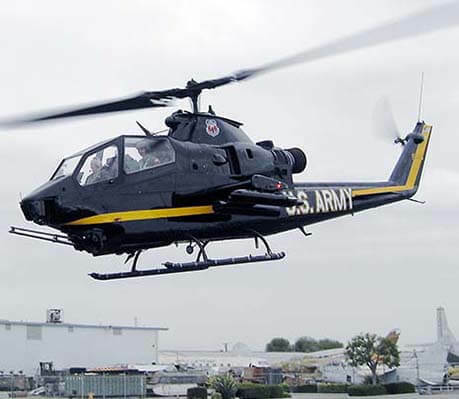 2001-Present Acquired by the Army Aviation Heritage Foundation, restored, and FAA certified. 1969- 1973 Assigned to Department of Defense Technical Institute, Ft Belvoir, VA.
1973-1976 Assigned to Ft Hood, TX. 1977-1979 Assigned to B Troop, 2d Squadron, 17th Cavalry, Ft Campbell, KY.
1979 Assigned to D Company, 1st Battalion, 2nd Aviation Regiment, Korea. 1979-1981 Assigned to Bell Helicopter Textron, Amarillo, TX. 1981-1986 Assigned to 214th Attack Helicopter Battalion (AHB), Ft Lewis, WA. 1986-1988 Assigned to HSC, 5th AHB, Ft Polk, LA. 1989-1996 Assigned to D Company, 1st Battalion, 2nd Aviation Regiment, Korea. 1996-2005 Assigned to the Michigan Army National Guard, Grand Ledge, MI. 2005-Present Assigned to the Army Aviation Heritage Foundation.